This past October I got the chance to speak at Obility’s B2B marketing conference, Marketing Loves Sales. The theme this year was “Customer Journey”, something the digital marketing industry has been talking about for quite a while, but mostly when discussing paid search and paid social. Since organic leads aren’t usually tracked in MAPS and CRMs such as Marketo and Salesforce, it is often more difficult to understand the organic customer journey, but it’s not impossible. Let’s talk about how we can optimize customer journey with SEO. First of all, why is understanding customer journey important? More traffic is great, but more relevant traffic that will result in conversions is even better. Understanding customer journey can help you increase the relevancy of your traffic and improve the user experience. If you make it easy for users to fill a form or download an asset, they are more likely to do so! With customer journey optimization you can provide better support to customers, online and offline. B2B users, in particular, are looking for robust customer support, since B2B products tend to be more expensive and complex. As SEOs and digital marketers, we need to make sure current users can easily find the support center and get their questions answered, but we also have to ensure that potential users know they will get all the support they need when the time comes. 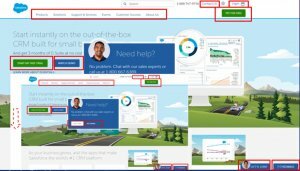 Finally, customer journey can help the sales team understand prospects better: which products would they be interested the most? Which assets are they more likely to respond to? Step 2: Understanding Your Customer Journey & Your Customer’s Goals. Step 3: Mapping Keywords & Offers to Each Step of the Customer Journey. Step 4: Identifying Issues with User Experience. Step 1: Tracking User Experience. This is a pretty busy homepage and there are a lot of call-to-actions. With GTM you could track the clicks on all CTAs and links on this page and have a better understanding of what users respond to. Do they go straight for the free trial or watch a demo first? Do they open a chat through the pop-up or through the bottom CTA? How many users actually scroll to the bottom of the page? Then you can pick and choose which GTM events should be turned into GA goals. Now that you have set up GA and GTM tracking, it’s time to utilize that data. I think the Google Analytics audience report is often overlooked in B2B, but it gives a lot of great information about website visitors. Before you can look at your audience report you will have to do a little GA clean up, in the Admin section. 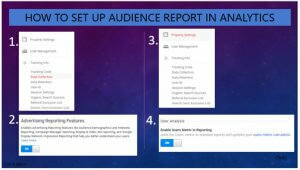 In Property Settings, give access to Advertising Reporting Features. Then, turn on Users Metrics in Reporting. While you’re at it, take a minute to make sure you turn on your Site Search, it’s a wonderful tool that allows you to record what your users are looking for and can’t easily find on your website. 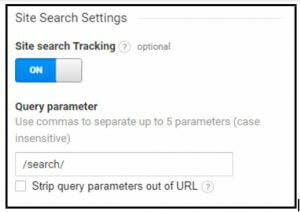 Perform a search on your website, copy/paste the query parameter, go to Admin > View > View Settings and voilà! Now you’re ready to dive in. Looking into users interest, location and age can feed into the kind of resources you offer users and help increase traffic relevance. For example, a client of mine had a very robust glossary that was getting a lot of organic traffic, but no conversion. After looking at the audience report we realized the traffic was coming from students, who would never convert and did not visit the rest of the website. When we migrated the website we decided to not migrate the glossary. Yes, the traffic went down, but all of the other metrics improved: overall bounce rate, time on site, pages/sessions, conversion rate, we even reduced the amount of duplicate content, because some glossary pages were so thin they were flagged as duplicate. Are you thinking about international SEO and considering building a new website for a new location or just translating some pages? The location + language report will help identify if there is really a need, especially language-wise. See above how 9 out of 10 countries use English and how the top non-English-speaking country, the Philippines, isn’t using Tagalog, but English? If I had to make a decision about international websites based on this data, I would say no need to translating, since English is the dominant language. As you can see, I’m looking at users and not sessions here, because one user can have multiple sessions. In terms of interest, I see that a good chunk of my users is interested in technology. I could use that information to create on-site content users would be interested in and it could also help me with link building and remarketing efforts. As we discussed earlier, the B2B sales cycle is very long, we want to catch users at the top of the funnel and help them progress towards the bottom. 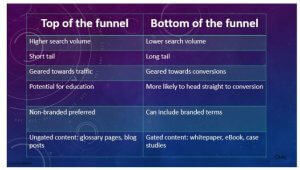 The keyword research will be a different process for each level of the funnel. In the “Awareness” part you want to look for question queries, “how to” or “what is”. Keywords in the “Interest” and “Consideration” levels are usually short-tail, they get quite a lot of search volume but they can be difficult to rank for. 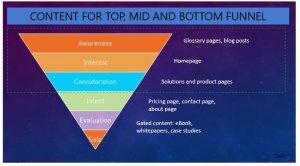 As you go down the sales funnel the queries will be become more refined and usually get less search volume, but are easier to rank for and are more likely to convert. The “Sale” level is branded because we know B2B users don’t buy the same day they start their research. Remember that your competitors will be different for each stage of the sales funnel – Obility won’t compete with other SEO agencies for “What is SEO”, at that stage we will compete with Moz or Search Engine Land. Since user intent is different at each stage of the funnel, your offerings should too. Someone just learning about SEO and its benefits is not ready to sign up for a webinar or download an ebook. By the way, are you calling them ebook, e-book, e-Book or eBook? Now you have perfectly tracked user experience and goals, it’s time to take a look at the potential roadblocks that can drive users away from your website. Plus any other section that is relevant to your users. If you want visitors to read your content you must give them easy access to it. 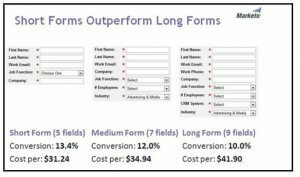 This test showed that adding non-essential fields were inflating their cost per lead by ~25%. “In the comments, please explain why you need this product”: I understand that this is helpful information to have, but I believe it is too much to ask of the visitors so early on. Another experiment from the Beymard Institute showed that “create an account” is the number one reason for form abandonment. 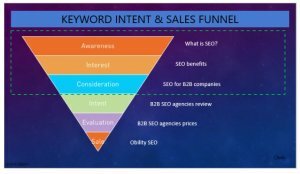 Remember the keyword funnel from Step 3? Users in the Awareness, Interest or even Consideration stages are not ready to create an account. These are easily avoidable and will make your users so much happier. The last thing I want to mention is choice overload. 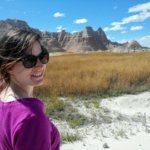 I went to Mozcon in 2017 and Dawn Anderson did a great presentation on choice overload. We are all overwhelmed with choices in our daily lives and we know how easy it is to get paralyzed by indecision. Marketers have to learn how to facilitate user experience, because users that are given too many options might end up choosing nothing. Use GTM to track everything, the possibilities are infinite. Explore Google Analytics, even if you think you won’t need the information it gives you. Turn on your site search! Not all keywords are suitable for the entire sales cycle. Spend a significant amount of time researching keywords & offers type. Ruthlessly audit your website for roadblocks. Users will get paralyzed by indecision if you don’t tell them where to look and what to do. Don’t ask for personal information at the beginning of the research process. The full presentation is also accessible on SlideShare.